Tajines in Moroccan cuisine are slow-cooked stews braised at low temperatures, resulting in tender meat with aromatic vegetables and sauce. They are traditionally cooked in the tajine pot, whose cover has a knob-like formation at its top to facilitate removal. While simmering, the cover can be lifted off without the aid of a mitten, enabling the cook to inspect the main ingredients, add vegetables, move things around, or add additional braising liquid. To learn how to make a Moroccan tajine first hand, consider taking A Taste of Morocco tour or a local cooking class from a chef at a cooking school or university closest to where you live. Tajine or tagine is a type of dish found in the North African cuisines of Morocco, which is named after the special pot in which it is cooked. 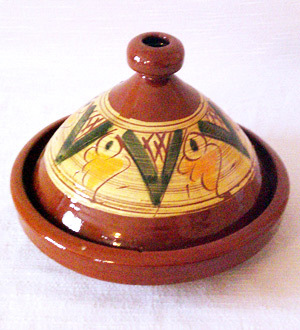 The traditional tajine pot is formed entirely of a heavy clay which is sometimes painted or glazed. It consists of two parts; a base unit which is flat and circular with low sides, and a large cone or dome-shaped cover that rests inside the base during cooking. The cover is designed to promote the return of all condensation to the bottom. With the cover removed, the base can be taken to the table for serving. 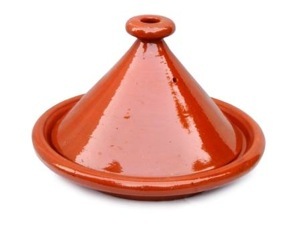 The clay used to make a tajine comes from various regions in Morocco. Morocco’s Sahara Desert has orange colored clay as does the Ouarzazate region. Some of the best cooking tajines can be found in the Tizin’ Tichka pass and tajines for decorative purposed in the pottery capital, Safi. 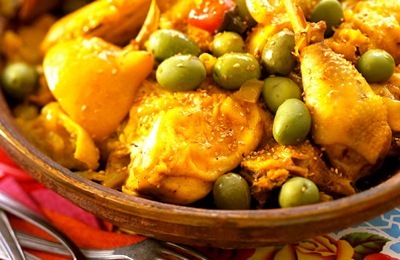 MOROCCAN TAJINE RECIPES: The following are a few of the most popular tajine recipes to recreate at home. Combine the oil and ground spices in a bow, then cut the beef into cubes, chop onions finely, and mix both into oil and spices. Let stand. Sear the meat lightly in butter, add any remaining marinade and enough water to cover-simmer until meat is tender while the meat is cooking, cover the prunes with boiling water. Set aside for 20 minutes. Drain the prunes and cook them in a small amount of liquid from the meat. Add the lemon peel, cinnamon sticks, and half the sugar. Stir the remaining sugar into the meat. 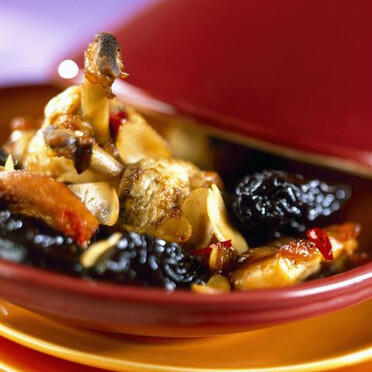 Arrange the meat, prunes, and their sauce on serving dish. Boil the remaining liquid from the meat rapidly to reduce it by half. Pour sauce over the meat and prunes. Garnish with almonds sautéed in a little butter and with watercress or mint. Serve with fresh bread, rice or couscous. 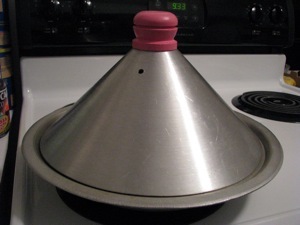 You are currently browsing the archives for the Aluminum Tajine category.